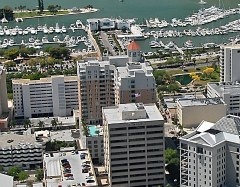 Completed in early 2007, 1350 Main offers condos with upscale simplicity right in the heart of downtown Sarasota on Main Street. Conveniently located close to a range of urban activities, residents are within walking distance to restaurants, boutiques, gift shops, art galleries, and bookstores. Just around the corner, you'll find the Selby Library, Whole Foods Market, exquisite Selby Gardens, and Marina Jack. Hop in the car for a short drive to enjoy shopping and dining at St. Armands Circle or swimming and sunbathing on beautiful Siesta Key Beach. Contact us today for more information or a tour of available listings. Ask a Question. We are here to help!